"Optimizing social media is not an exact science. It's about using web analytics data to make informed immediate decisions and to formulate long term strategies". This is a quote from the book "Social Media Branding in the Age of Obama" by Eric Hamilton. There has been a lot of talk about social media in the past 12 months. 2010 has just arrived and everybody claims to be a social media expert for 2010. If you are in business, then I am sure that you have been approached by a So-Called Social Media Expert. In addition, you probably have been getting a lot of pressure from colleagues, subordinates, managers, friends, news and other sources about embracing social media. News Flash: You don't need to know about the trendy buzz words in Social Media to be effective. Do you know about Digg, Delicious, Plaxo, StumbleUpon or Flickr? No? It doesn't matter if you do or don't. Here's a tip for all of you business people trying to carve out a social media future. There are many to ask, but I will give you one to remember. "How many people from the social media site X are doing Y at my web site and how can I optimize Y?!?!?!?" If your So-called Social Media Expert cannot answer this question or if they cannot propose a comprehensive solution to solve for this question or if their answer confuses you more, then fire them and pick up a copy of "Social Media Branding in the Age of Obama" by Eric Hamilton http://www.socialmediaobama.com . This guide will show you how to configure, measure and optimize the most popular social media web sites. The guide is an easy read and uses simple language with large screen captured images. It's a must have for anyone planning to do business in 2010. 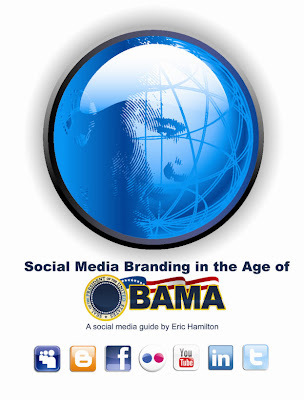 For more information on Social Media Branding in the Age of Obama visit http://www.socialmediaobama.com . Eric Hamilton is the author of "Social Media Branding in the Age of Obama" and a Yahoo! Engagement Manager specializing in analytics.